One of the most fascinating stalls at the Great Exhibition in 1851 was that which contained the dolls of Mme. 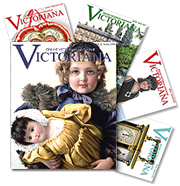 Montanari, a London manufacturer of one of today’s most collectible antique wax dolls. Referring to the Montanari stall, the jury report said: "It consists of a series of dolls, representing all ages, from infancy to womanhood, arranged in several family groups, with suitable and elegant model furniture. These dolls have the hair, eyelashes, and eyelids separately inserted in the wax, and are, in other respects, modeled with life-like truthfulness." English, circa 1850-1860. This is a rare 21" antique doll marked Montanari, still retaining its original "Montanari" ink signature on the lower front torso on its original cloth body, superior modeling of poured wax shoulder head with a very expressive face, poured wax limbs, original inserted blond human hair, blue set glass eyes, stunning antique silk costume and hat (possibly original), from a private collection. Was for sale by Debra's Dolls-Antique and Collectable Dolls - $4,950. The use of dolls dates from the most remote times and was common in all countries, barbarous as well as civilized. Precisely as a child in a princely mansion in England played with an expensive finely dressed antique wax doll, so did the child on the African continent take delight in a piece of wood or bone carved rudely in the form of a baby and decorated with a few rags. In past centuries, the keeping of a doll became a part of the home education of girls. As in the case of most other toys, dolls were at one time imported into Great Britain chiefly from the Netherlands; and hence not an unusual name for a doll was a Flanders baby. These old Flemish or Dutch dolls were made of wood, with neatly formed faces and flashy dresses, the cheaper kinds having slender wooden legs. In European continental countries, women and children were mostly engaged in the manufacture of antique dolls. Some carved the heads and bodies, others painted the faces and necks, others prepared legs and arms, while a different class cuts out, sews, and puts on the dresses. These operations were seldom executed in one central location. Usually, dealers bought the fragments prepared by villagers, and then arranged for them to be assembled. As the time employed in the preparatory processes was scarcely of any marketable value, the prices of fragments were minimal; hence, the inexpensive dolls with painted faces and ringlets could be imported at a cost below that at which they could be executed by hand-labor in England. When, however, we come to the high valued antique dolls with molded wax or composition faces, arms and feet, glass eyes, stuffed bodies, flaxen ringlets, and gauze dresses, the English became a prominent manufacture. In London there were a considerable number of doll-makers, manufacturing dolls of wax, gutta-percha, India rubber, etc. In the doll making trade, there was an economic division of labor. There were doll head makers, doll leg and arm makers, doll sewers, doll stuffers, doll wig makers, doll eye makers, and doll dressers. For some dresses, remnants of calico, gauze, silk, and other materials were procured from shops; but for the fashionably dressed dolls it was necessary to buy goods on a large scale. The extent to which the original antique doll glass eyes were manufactured is surprising. British court records list a 19th century glass manufacturer at Birmingham who received an order for £500 worth of doll eyes. The cheaper doll eyes were simply small hollow glass beads, made of white enamel and colored with black or blue, but without any attempt at variety or effect; while those eyes of a higher quality had a ring of color to represent the iris. The introduction of wires and mechanism to make the eyes move or wink at pleasure and also to cause the doll to utter the sounds "papa" and "mamma" introduced a corresponding rise in prices. Blue glass eye dolls were popular in England during Queen Victoria’s reign, while black eyes found a larger market on the continent, especially for Spanish dolls. Black dolls of gutta-percha were made for export to America. Composition heads were usually made of papier-mâché, cast in a mold, waxed and painted to represent the features. Dolls of the ordinary kinds were manufactured in New York and in some New England cities, but a large proportion of the dolls sold in the United States were imported from Germany, where the principal seat of manufacture was Sonneburg in Thuringia, a town in which doll-making employed a majority of the inhabitants. In 1850, Tuttles Emporium advertised “beautifully dressed” wax dolls from 50 cents to 10 dollars; “undressed” wax dolls from 25 cents to 8 dollars. In 1866, R.H. Macy & Co. in New York announced the arrival of “3,000 Fine Wax Dolls” just imported for the holiday trade. The "talking-dolls" invented by Edison, in which the phonograph was ingeniously employed, were another advance in the manufacture of dolls.